For couples interested in a vintage style ring, cushion cut diamond engagement rings may be the perfect choice. With an antique flair paired with a soft, romantic shape, these diamonds make stunning yet unpretentious engagement rings. The cushion shape, which is either square or rectangular with rounded corners and a "puffy" appearance, is a pleasant alternative to emerald, oval or princess cuts. Cushion cut rings can often be a challenge to find. They are still not available in abundance at local jewelry stores or designer boutiques. For a couple that wants to design their own cushion cut ring, the best option is to find a suitable loose stone and have it set in an appropriate mounting. 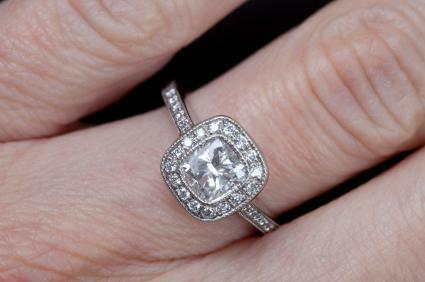 You can also seek out antique or vintage cushion cut engagement rings at pawn shops, family heirlooms, or estate sales. Couples should take all necessary precautions when purchasing an older, used ring to be sure it is of high quality and their investment is suitably protected. For those who prefer to shop online, there are a variety of cushion cut diamond rings available at several sites. From simple solitaires to elaborate settings, rings can be found in a range of styles and prices. Classic solitaire ring with accents: Priced just under $2500, this classic ring is done with a certified 5/8 carat cushion cut diamond. It is set in white gold and is simple yet stunning. Split shank frame: Priced just over $3500, this ring and is done in a vintage-inspired style. It has a cushion cut diamond center framed with accent diamonds and set on a split shank platinum band that also features accent diamonds. Double square frame: Priced around $17000, this gorgeous ring has a cushion cut center diamond and a double square frame of round accent diamonds all set in gorgeous platinum. This ring will ship to a store near you. Designer diamond frame twist ring: Set in 14K White Gold, this ring is priced just under $3300. Part of the Vera Wang LOVE Collection, this ring is a stunning piece that features a princess cut diamond center set in a double frame, twisted split-shank band with small round accent diamonds. For a special touch, two princess cut sapphires are set in the ring's bezel. Diamond solitaire ring: Priced around $5000, this classic solitaire features a certified one carat cushion cut diamond set in white gold. Novo: This ring features a brilliant cushion-cut diamond set on a band of diamonds. This ring is done in platinum and priced at $13,700. Legacy: A cushion cut diamond center is surrounded by diamonds in this Edwardian-inspired platinum ring. It is priced at $14,900. Because the shape is still rare in modern rings, cushion cuts work well as solitaires that draw the eye just to that central unique gem. Many women prefer to incorporate accent stones into their rings. Ovals or trilliant shapes are lovely complementary styles for this purpose. Often accent stones will be set in channels or otherwise subdued so as not to distract from the center stone's rare shape. The most popular setting for the cushion cut stone itself is a four-prong arrangement that holds it securely without obscuring the shape. Older rings may use up to eight prongs, but other settings are not recommended because they detract from the shape. Because a cushion cut diamond has approximately 60 facets, up to 20 or more facets fewer than modern rings, the stone's sparkle and fire is far less than round diamonds or other precisely cut shapes. Furthermore, many cushion cuts incorporate a cutlet in the stone to add depth, but an overly large cutlet will create a deep shadow within the stone, obscuring its beauty. Because the stones have fewer facets, clarity is especially critical: even minor flaws will be more noticeable. Similarly, the color of the stone is also a crucial characteristic of its quality. 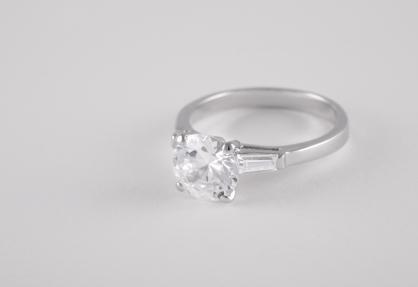 Cushion cuts became immensely popular during the latter part of the 1800s and the early 1900s. While the shape was often called a pillow cut because of its resemblance to plump pillows, it was also called a candlelight diamond because it was cut specifically to be most brilliant in candlelight - before the advent of electric bulbs. Contemporary cushion cuts may be more symmetrical than older rings because of modern refinements in lapidary skills, but generally cushion cuts are still difficult to find outside antique rings. Many old gems are cushion cuts, including the infamous Hope Diamond. Cushion cut diamond engagement rings, tremendously popular over a century ago, are becoming trendy again in modern rings. With a sensual shape and subtle sparkle, they are a sophisticated alternative to flashier designs yet do not sacrifice either the beauty or romance that symbolizes the love a couple shares.